Want To Take A Walk With Me And Get A Key To Happiness? Want to take a long walk with me and at the same time raise your vibrations up like crazy? While I like to think I’m a fun person to be around let’s face it…most of you, dear readers, are not next door but I can still share with you how to do this – even with out me. It’s something I started doing when I was recovering from injuries to both my body and my spirit. I’ll be really honest that lately I fell away from doing this as life got busy, I was redirected (you know how it is). That’s okay. It happens. After all, I am human too! But I was recently reading over one of my older journals and came across the passage where I wrote about realizing how therapeutic what I was doing and started calling this my Gratitude Walk. You see, I had broken my foot and fractured an ankle. Gonna be real honest here, I do lots of things well but motoring around on crutches was not one of them. I got really frustrated when trying. The kind of frustrated that brings you either to tears or looking for someone to snap at. I didn’t enjoy feeling that way. I had discovered the power of gratitude to shift my thoughts and energy recently. Boy did I have list after list in my journals! If you haven’t I highly recommend going back over your old books. You’ll learn a lot about yourself! So I made the slow, painful walk a game. For every step I took I would name something I was grateful for. Thus, it because my gratitude walk. Truth be told at the time the slowness of it all felt like a blessing because sometimes it was tough to come up with lots of ideas. And I became happier, healthier and healed. I kept up the practice when I started walking with out those crutches, and then without help at all. Even when I was back being in charge of walking my own dog. Okay, granted he’s a 2-steps gotta stop and sniff something type of walker but I did it. I’m going to be really honest that now I’m back to walking at a normal pace I use a two-step to one grateful thought deal. What can I say? I walk fast! I often take my camera and walk the pier near me. I’m working to develop my skills. Last week I added my Gratitude Walk practice to the mix. Interestingly enough I found so many amazing things to photograph that I’d never noticed before and had more fun than ever. You see, gratitude unlocks all the joy, love, abundance that so many of us are craving. You want the key to happiness? It’s being grateful. Like deep down, passionately grateful about everything. Incorporating a regular, loving practice of focusing your attention on gratitude DAILY, will make you healthier, happier and open you up to even more joy and abundance. Join me in a gratitude walk? Or maybe you take a long elevator ride each day to work. Each floor can be a trigger for a grateful thoughts. Doing the dishes? Each plate, every knife or fork can be your basis for some gratitude. Heck, brushing your hair, vacuuming, using the stairs…you get me? 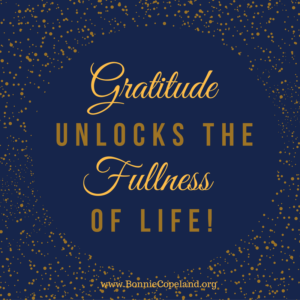 Will you join me in creating a routine for gratitude? What will you do?